For many years Izumi (no) Kami Kaneshige (和泉守兼重) was thought to be the same smith as Kazusa (no) Suke Kaneshige (上総介兼重). Their workmanship is similar and even their signature style was very much alike. 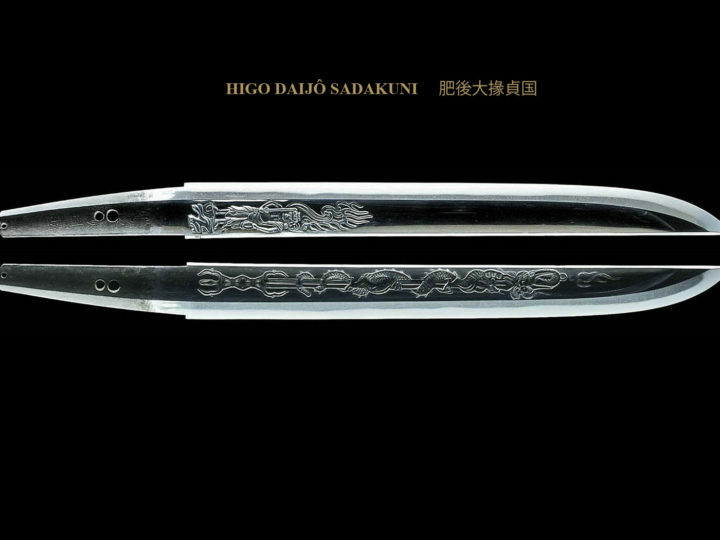 This theory was put to rest when a sword came to light that was a joint work of Kazusa (no) Suke Kaneshige (上総介兼重) and the third generation Edo Sandai Yasutsugu (江戸三代康継). 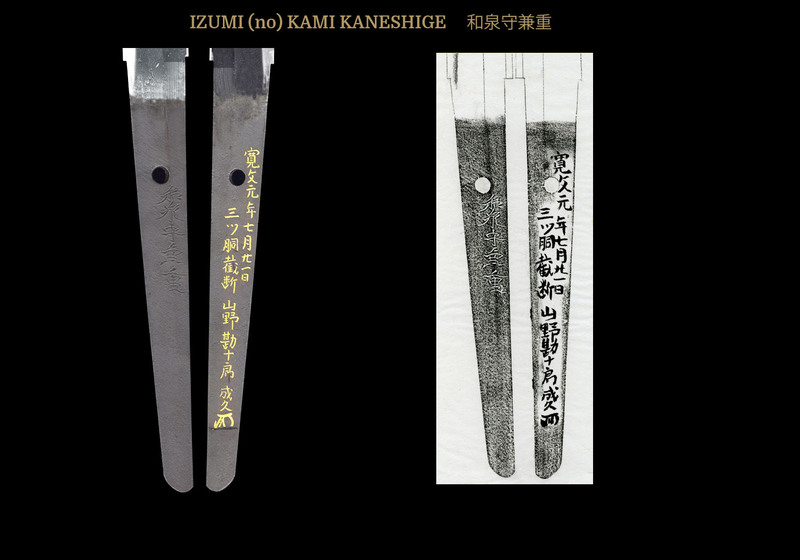 This was a dated work and from the date of the blade together with the fact that Kazusa (no) Suke Kaneshige (上総介兼重) also inscribed that he made it when he was 43 years old; his date of birth could be determined to have been Kanei 2 or 1625. 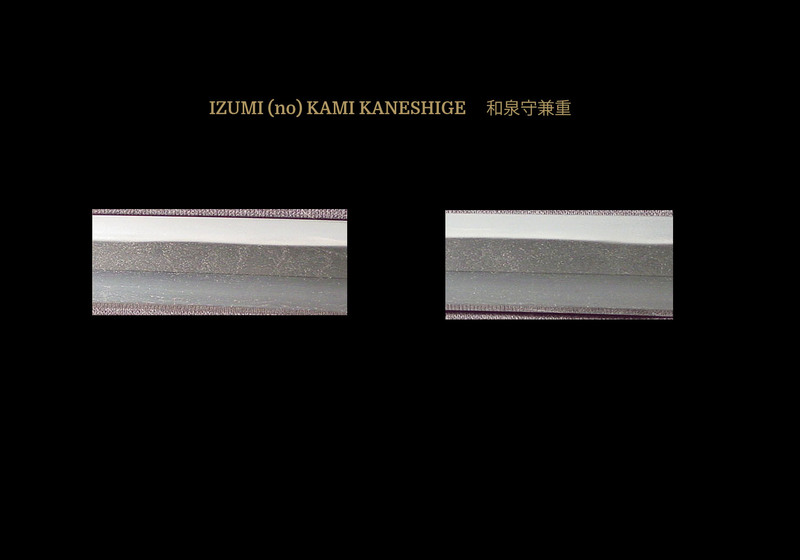 Since there exists a dated sword by Izumi (no) Kami Kaneshige (和泉守兼重) of this same date, it has been determined that Izumi (no) Kami Kaneshige (和泉守兼重) was either the father or teacher of Kazusa (no) Suke Kaneshige (上総介兼重). Thus when I refer to Kaneshige (兼重) throughout the balance of this paper, please understand that, unless I specify differently, I am referring to Izumi (no) Kami Kaneshige (和泉守兼重). Izumi no Kami Kaneshige (和泉守兼重) was one of the top smiths from Edo (Tokyo) along with Yasutsugu (康継) and Hankei (繁慶). There are a couple of theories as to his area of origin. One common thought is that he was from Echizen Province. The other proposed that he was a student of Senjuin Morikuni (千手院盛国) of Edo. Morikuni (盛国) also had the title of Izumi (no) Kami (和泉守) and his swords are similar to those of Kaneshige (兼重) in shape, style, and signature. For that reason, Kaneshige’s (兼重) origins are still somewhat up in the air and perhaps further information will come forth in the future to clarify this point. Kaneshige (兼重) was known to be a maker of yanone (arrow points) in his early years. Kaneshige worked for the Daimyo Todo Izumi (no) Kami Takatora. As mentioned, his earliest dated work is Kanei 2 (1625) and this puts his working years into a period of transition between the ages of Keicho-Shinto and Kanbun-Shinto. Kazusa (no) Suke Kaneshige (上総介兼重), however, worked in the Kanbun Era and his work reflects this. Both of these smiths had strong ties to Nagasone Kotetsu (虎徹). This is especially true of Izumi (no) Kami Kaneshige (和泉守兼重) who is generally thought to have been the teacher of Kotetsu (虎徹). SUGATA: Kaneshige (兼重) made most of his swords in shinogi–zukuri katana or wakizashi form. 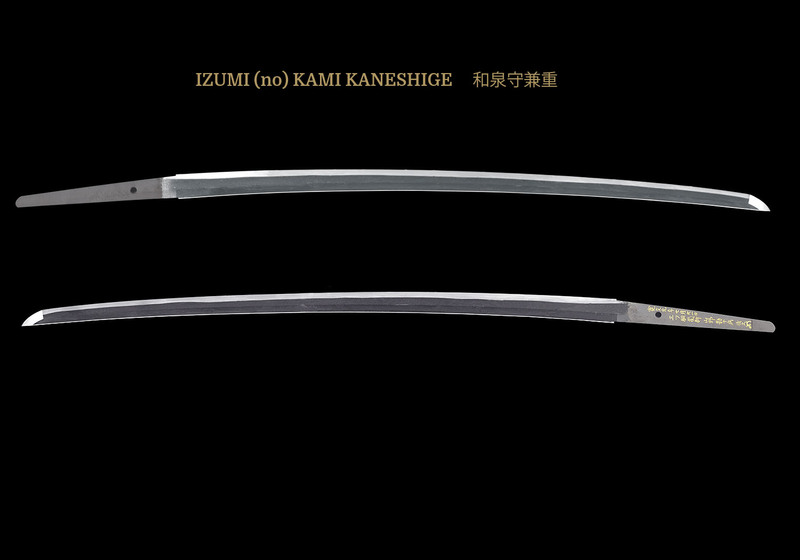 He also made a few hira–zukuri wakizashi in sun–nobi form, but no tanto in hira-zukuri form have been found to date. The sori is modest and the kissaki is medium. The blade width is either average or somewhat wide giving it a strong appearance. There is a marked difference in the width of the blade from the moto to the saki. While his early blades will be more Keicho-Shinto is shape, his later blades reflect the typical shape of the Kanbun period. JITETSU: The jigane is slightly hard and is usually ko–mokume or itame mixed with masame–hada. The masame–hada will be especially pronounced in the shinogi–ji. There will be plenty of ji–nie. HAMON: Most of his hamon are wide suguha combined with shallow notare. The nioi base is profusely covered with nie giving it an overall nie–deki appearance. Many of his hamon have gunome –ashi, some of which are close enough together form a true gunome pattern. Nie patterns such as kinsuji and sunagashi will be found. BÔSHI: The bôshi will have a smooth curve that will turn back in a ko–maru shape. The kaeri will be of various lengths, but usually on the short side. Mishina bôshi can be found as well as such things as hakikake. HORIMONO: Bo-hi (single grooves) are found at times. NAKAGO: The nakago will taper sharply at the tip forming a ha-agari kurijiri shape. The yasurimei are generally sujikai starting with a relatively modest slanting, which gradually increases as it approaches the tip. Some nakago are finished with a decorative horizontal filing at the top. This is not a full kesho finish as was done by some of his students. An important kantei point is the shape of his nakago. The mune will be flat and the ha side will be slightly rounded.